Well done to everyone who took the challenge to cycle from London to Brighton. Together you raised thousands of pounds for charity! 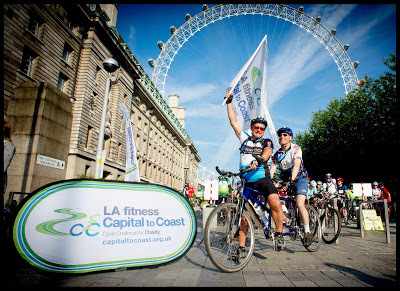 We’re pleased to announce that registration is now open for Capital to Coast’s next London to Brighton cycle ride. Sign up now for London to Brighton. A huge thank you to LA fitness for once again sponsoring a great day for a great cause. This year’s event raised money for three charities – Norwood, the Down’s Syndrome Association and Action Medical Research. Pictures are available to purchase from Sussex Sport Photography. Profits from photo sales go to the partner charities.